October Blog Hop - Last Stop! Welcome! Today is October 1st and we have a new release for you at Technique Junkies! This is the last stop on the TJ New Release Blog hop, so if you started here, I encourage you to go back to the TJ Design Team blog - the beginning - to start again. You won't want to miss any of the inspiration the girls have for you! Before we get to my art, I just wanted to remind you that the October release stamps are 15% off through October 8th. Simply add what you like to your shopping cart and they will be discounted automatically until then. The first uses the new Cocktail Joy set. This was so easy to color; I just used Grey Memento ink and colored here and there with Copics. I just pulled the perfect piece of background paper from my (extensive) stash, and viola! Instant Christmas Card. I may make some of these some of my Card recipients this Christmas, but I think I might only use the top part of the stamp on the outside (Joy is just a cocktail away) and the bottom part (Merry Christmas) on the inside. This card uses the Grace in her Heart stamp. 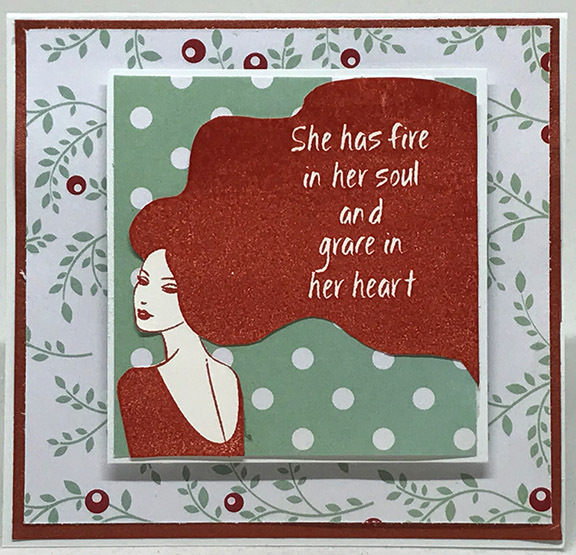 I simply stamped her in Rusty Hinge Distress Ink, then cut her out so I could get that polka-dotted background behind her. Again, just a simple stamp, a little cutting, and some background paper. This is my personal favorite stamp from the release! I love inspirational and uplifting stamps and I just had to use this saying on a stamp. It was fun to design, and even more fun to use! This uses the Give Thanks stamp with Nuvo Glitter Markers. 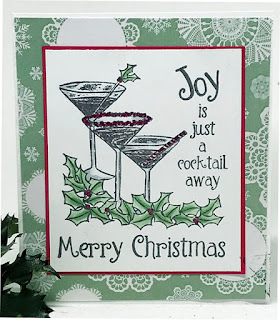 The background is just white paper put through and embossing folder, then highlighted with ink. 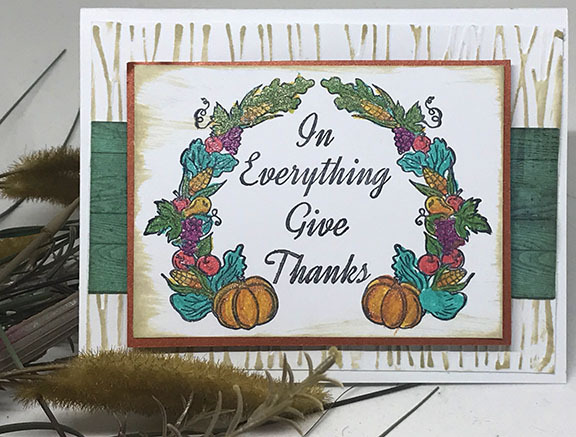 This makes a great Thanksgiving card and is perfect for table place cards for Thanksgiving! Well, that's all I have for you today. It's time to go shop! Make sure to take advantage of the 15% discount on the new October release stamps. Thanks for coming by today!